Unique performances, focused on the Derry Walls, the Shirt Factories and Austin's to take the stage for Northern Ireland’s Heritage Angel Awards at Guildhall Derry~Londonderry on 6th November. A baking challenge like no other! Join UAH for Heritage Half Term at St. George's Market on Monday 29th October 2018. See the built heritage bakes at Bake A Building ~ The Big Building Bake Off, stalls, entertainment for all. 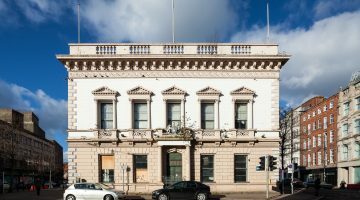 UAH welcomes and supports Belfast City Council’s decision to grant approval for listed building consent for the conservation-led works to Bank Buildings, Belfast. Ten days after the Bank Buildings fire it appears that there is still no plan, either to address the plight of traders, or to assure the future of the B1 listed building. Catastrophic heritage fire raises important questions? On the night of Sunday 24th June, fire broke out in an historic building at 163 Ormeau Road. Part of the property known locally as the Old Builders Yard, the 130 year building was formerly the headquarters of renowned Belfast construction firm H&J Martin, one of Northern Ireland’s oldest construction companies. Meanwhile the decimation of the architectural character of Ulster continues unchecked. Entries have now closed for this year’s Heritage Angel Awards, keep checking here for further updates on shortlisted candidates.